Precisely what we need once Easter has passed and all the candy that we haven't devoured or the bunny hasn't doled out is now on clearance - another sweet treat review!!! Wilfred Brimley, just send me the box, stat, I'm gonna get me a case of the diabeetus any day now. Yeah, a lot of fuss gets made this time of the year about Easter candy, like the peanut butter eggs (oh goodness), the jelly beans, the candy eggs, the chocolate bunnies. For me, and I know I'm weird and about to gross out 90% of you, but black jelly beans - those are where it's at. My absolute favorite. Aside from maybe Cadbury Creme Eggs. And anything Reese's-related. But ever hear anything about Passover treats? No? Me neither. 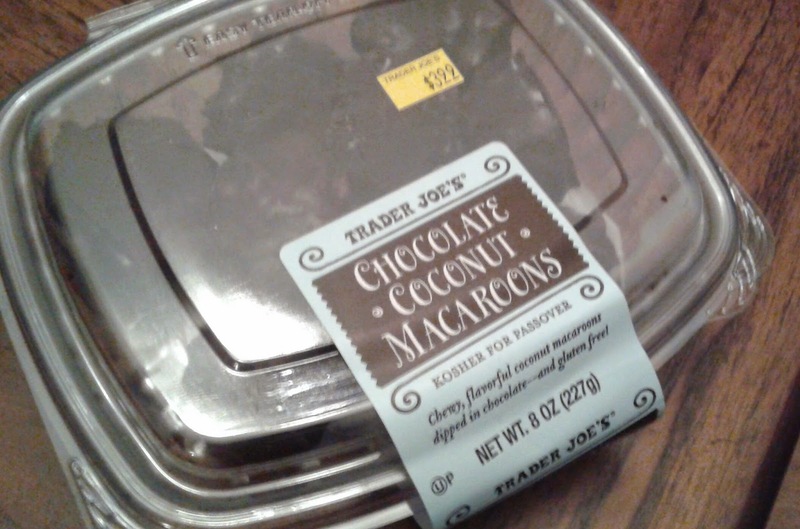 I guess in the name of equal opportunity sweet-samplin', when Sandy and I spotted the Trader Joe's Chocolate Coconut Macaroons with the "Kosher for Passover" label stamped right up top, we just had to try. To get this out of the way right now, check this handy visual guide to distinguish between macarons and macaroons. These,with the double-o diphthong, are of the coconuttier non-sandwich variety. Or at least they're supposed to be. Honestly, you could tell me they were a special edition Entermann's concoction, and I would have believed you, because it's pretty much exactly what they taste like. Whereas almost every other macaroon I've ever had were chockfull of chewy coconut, these aren't. Instead these macaroons, while definitely having coconut flavor (and a good dash of citrusy orange peel, too), the overriding texture and taste is just super dense cake-y stuff. 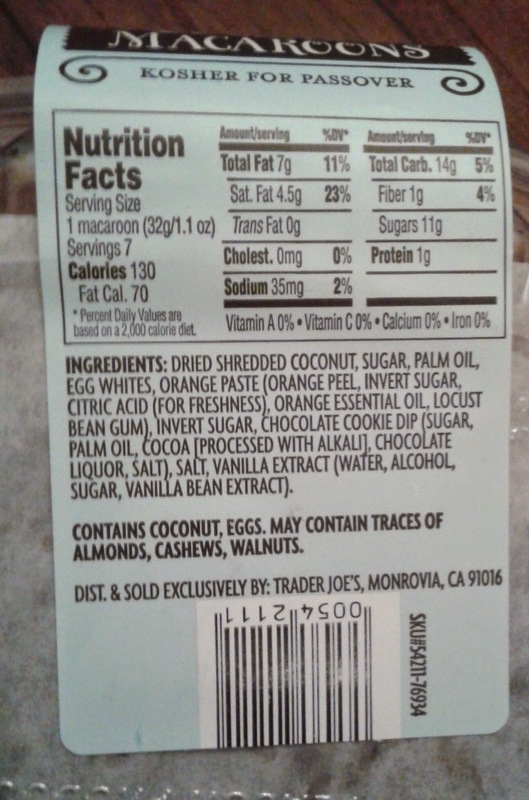 I don't really understand how that works, seeing as "shredded coconut" is the number one ingredient. I could understand if it were almond or coconut flour, because of the density, but honestly, there just wasn't that much shredded coconut in ours. Great, now I'm questioning my sanity. The chocolate coating tastes and feels just like the gas station packaged donut variety too - not bad, but nothing too terribly special either. Probably a lot of palm oil. Keep in mind that "kosher for Passover" for any kind of pastry or confection is never going to be as good. Loads of limitations, but thanks for trying what some of us get stuck with annually. Macaroons are an abomination! Someone needs to start making Kosher for Passover Matzah toffee- now that is delicious!